Buspin (Buspirone) is an anxiolytic (anti-anxiety) medicine which works in the brain and helps to reduce anxiety. Although its exact mechanism of action is not completely known, medical research has pointed out that this medicine exhibits a considerably high affinity for the serotonin receptors in the brain, as well as the D2-dopamine receptors. 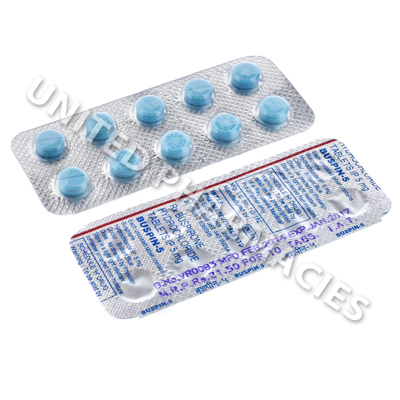 Manufacturer : Intas Pharmaceuticals Ltd.
Buspin (Buspirone) is an anxiolytic (anti-anxiety) medicine which works in the brain and helps to reduce anxiety. Although its exact mechanism of action is not completely known, medical research has pointed out that this medicine exhibits a considerably high affinity for the serotonin receptors in the brain, as well as the D2-dopamine receptors. Many experts have hypothesized that neurotransmitters such as serotonin can contribute to anxiety. After administration, absorption occurs quickly and it enters the blood stream. It starts to work on the brain and modifies the action of neurotransmitters associated with anxiety. This can help to reduce fear, stress, an irritated mood, vertigo, motor tension and other symptoms of anxiety, both physical and mental. Treatment can help those with GAD (generalized anxiety disorder) lead an improved life with less stress. Other disorders for which researchers have conducted studies include depression, impotence and attention deficit hyperactivity disorder. Buspin (Buspirone) is provided in tablet form, and each one contains 5mg of the active ingredient. Patients affected by anxiety may be told by their doctor to start out by taking 5mg (one tablet) 3 times per day. It will be necessary to remain in regular contact with your doctor, so that your response to treatment can be assessed. Adjustments or modifications to the dosage regimen may be made by your doctor, so that the most effective maintenance dosage can be determined. You must not take more than the amount recommended by the doctor providing treatment. You will need to tell your doctor about any side effects or reactions experienced while taking this medicine. Although it is considered to be less common, some serious reactions that will require immediate medical attention are possible. These include blurring of eyesight, abnormal muscular movements, seizures and other potential severe reactions that are not listed here. This medicine can interact with MAO inhibitors, which could result in a serious drug reaction. Your doctor will order you not to take it if you have administered an MAO inhibitor within the past 14 days. Eating grapefruit or consuming grapefruit juice could lead to a higher than normal amount of the medicine in the blood. You will most likely be directed to avoid grapefruit during treatment. Always use Buspin (Buspirone) as you have been prescribed by your doctor. Never self-medicate or change your dosage without first consulting your doctor. The correct dosage can vary depending on your health, medical history, and the severity of the condition being treated.